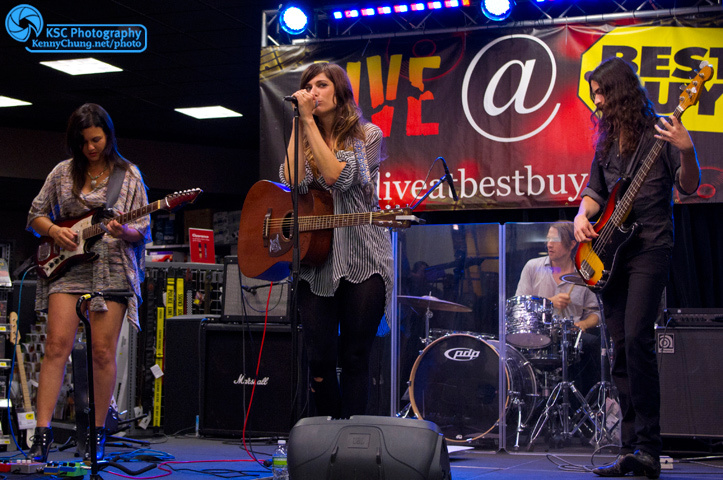 Nicole Atkins performing an abbreviated set at Best Buy in Union Square New York City. 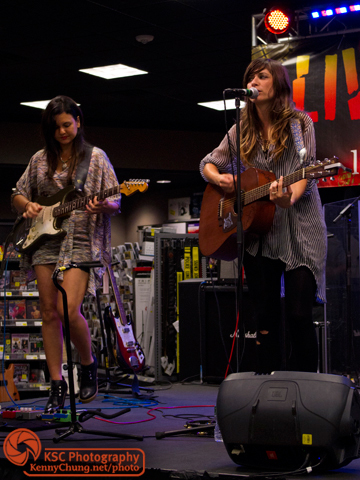 The crowd was intimate and the concert was also broadcast live online as part of the Live @ Best Buy summer concert series. The band was Nicole, Irina, Jeremy and a drummer filling in for Ezra. Posters and CDs set up before the set. 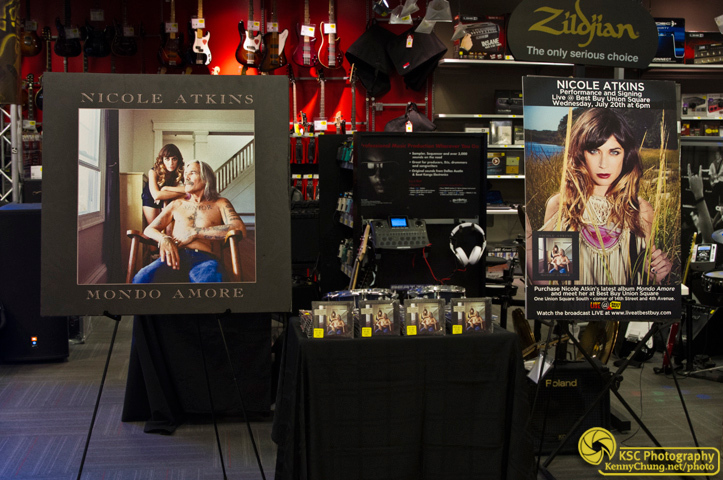 Nicole actually took home one of the vertical nylon posters (on the right) and signed a bunch of other copies for the store. 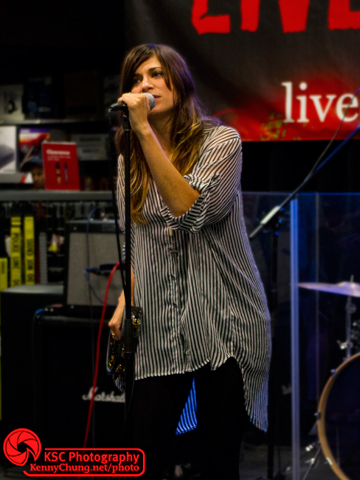 As usual, Nicole Atkins & The Black Sea started off the set with "Heavy Boots" from the album "Mondo Amore". 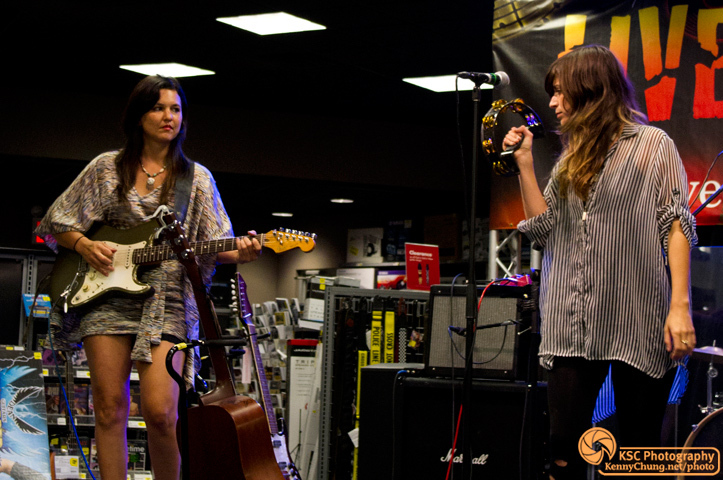 Irina Yalkowsky with her Fender Stratocaster guitar and Nicole Atkins with a tambourine she picked up in the store and opened on stage. 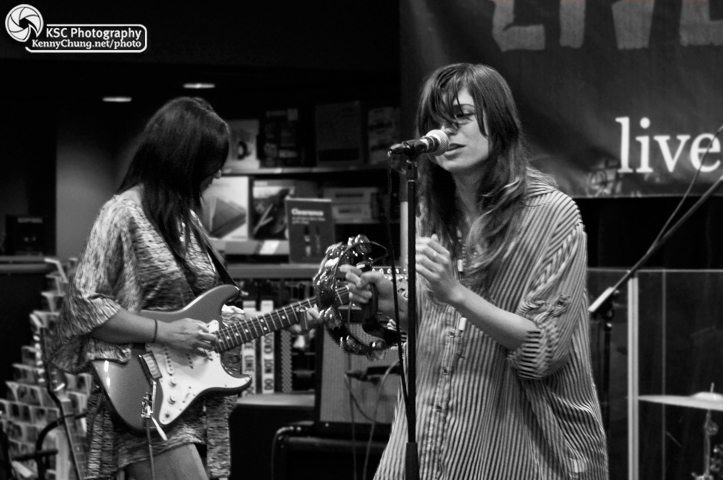 Nicole Atkins and Irina Yalkowsky performing "You come To Me", I believe. 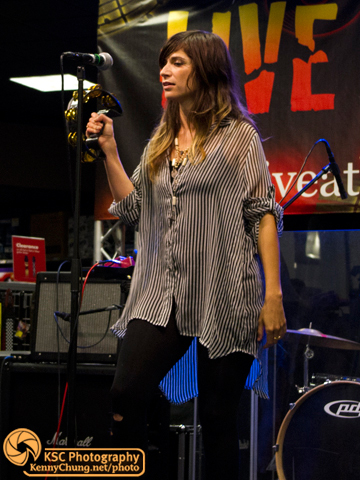 Nicole Atkins with tambourine in one hand, adjusting her microphone with the other. 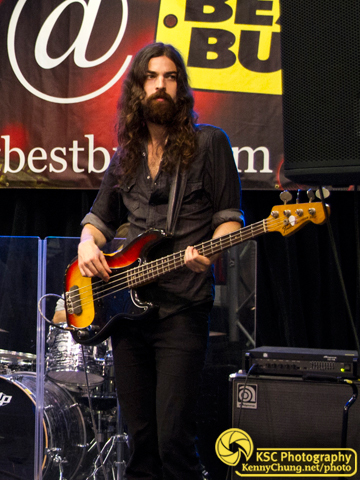 Black Sea Bassist Jeremy Kay on stage with his Fender P bass in sunburst. 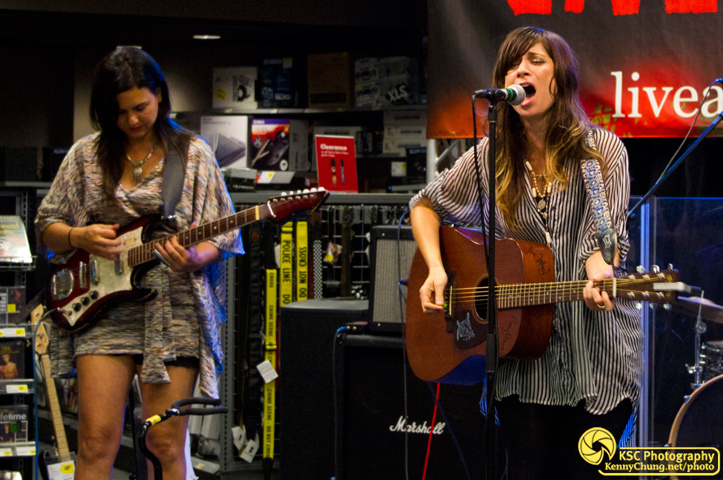 Nicole Atkins and Irina Yalkowsky performing "Cry Cry Cry". One of the only two songs from the set that weren't from "Mondo Amore" was a cover of "Vitamin C" by Can, which the sound tech was really into. 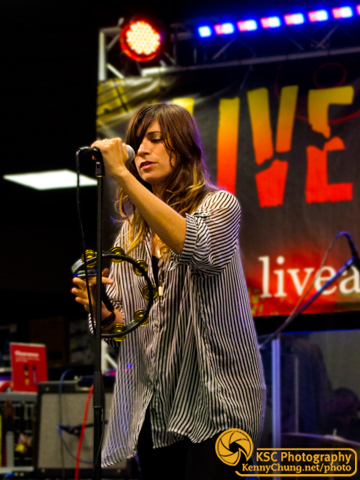 Nicole Atkins playing tambourine on "Vitamin C". 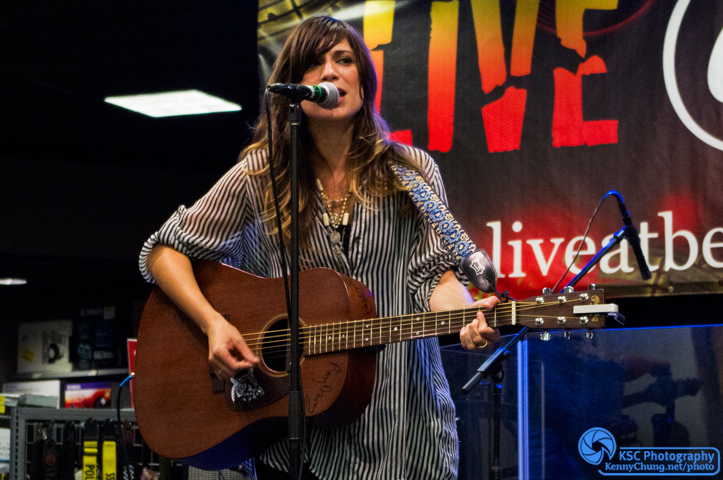 Nicole Atkins covering Cotton Mather's "Monterey Honey" by herself on acoustic guitar. Her rendition of it is great and I'm glad it's become a staple of her live sets. 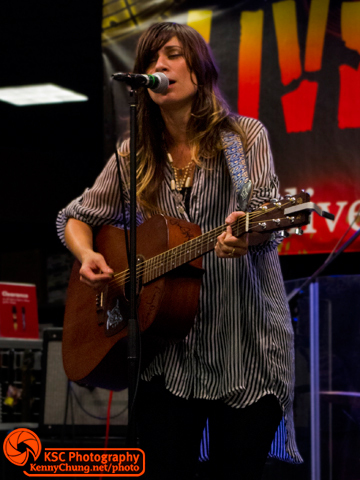 Nicole Atkins with her Martin acoustic guitar performing "Monterey Honey". 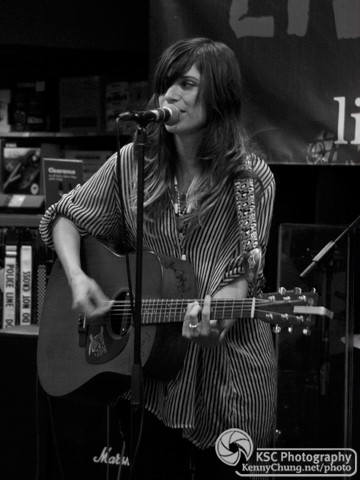 Nicole Atkins & The Black Sea speeding it back up with Nicole's latest single "Baby Don't Lie". 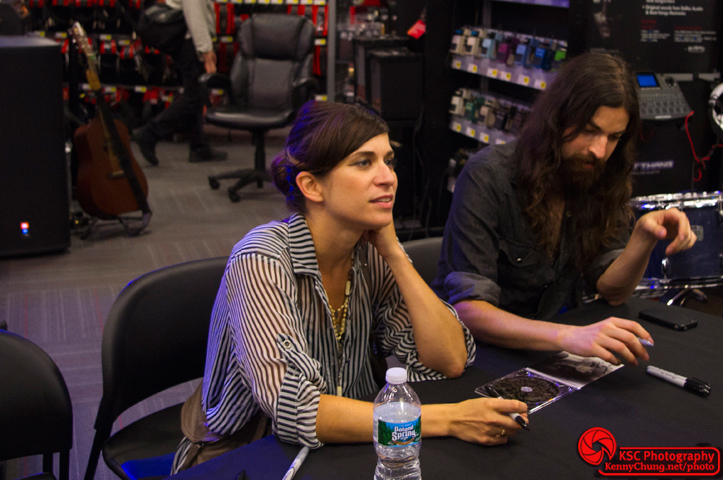 Nicole Atkins & The Black Sea seamlessly segued from "My Baby Don't Lie" into the first single from "Mondo Amore", "Vultures"
Nicole, Jeremy and Irina signed autographs after the show. I got the impression that a lot of people were seeing/meeting Nicole for the first time. Not the best venue to do so, but the performance was still great. 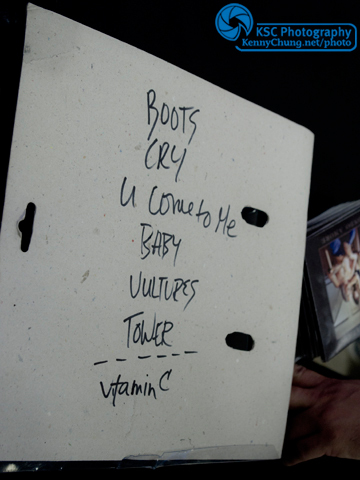 The (out of order) set list that Nicole wrote on the back of the tambourine packaging.